The Cocktail Vultures don’t always have to be so fancy. Occasionally, we like to imbibe one of our favorite spirits in a more casual way, maybe even allowing a professional bartender to mix it for us so we can enjoy some nightlife. 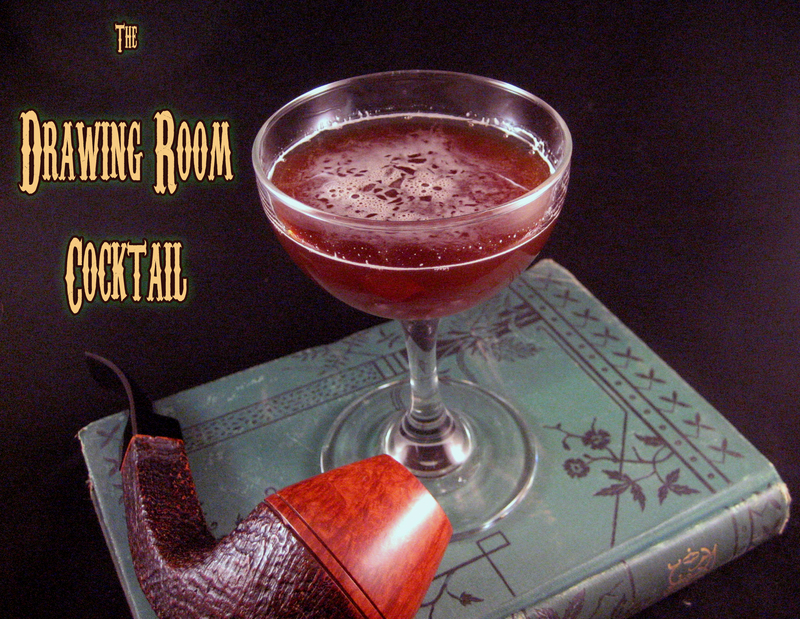 We think our latest drink does this very well — with absinthe, that most formalized and mysterious of spirits. It’s pretty, too, and may have you singing “Choo Choo, Charlie!” by the end of an evening. Stir thoroughly and add a straw. If you wanted to dress it up with a cherry, it would do no harm. The Cocktail Vultures are ever on the prowl for methods and ingredients to facilitate your drinking, and for a long time we’ve been in a quandary about banana drinks. Everyone loves them, but a good banana ingredient can be elusive. Those flavored schnapps-type liquors are too phony-tasting, and just throwing in a fresh banana is a real roll of the dice. Too green and it’s a grassy tummy ache. The just-right banana requires more planning than we are sometimes willing to give — what if you want your banana drink NOW? 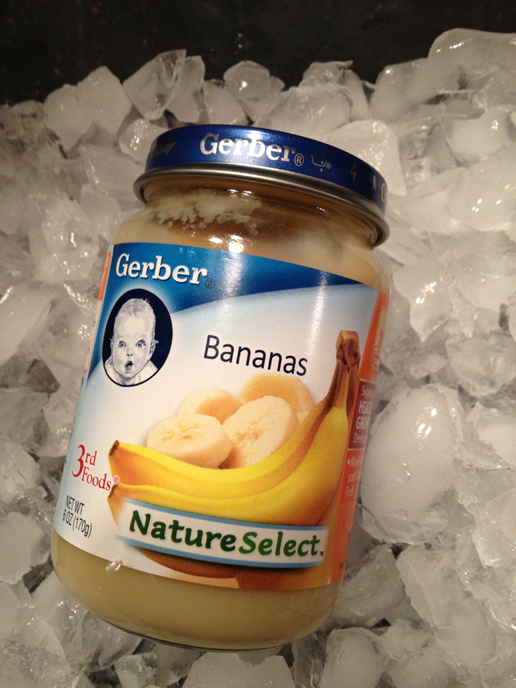 We searched our mental database and pulled out a fond memory from childhood: banana baby food. Many of us remember sneaking a jar of this from amongst a younger sibling’s supply of squash and peas — the smooth, slightly-sweet texture, the aroma of fresh bananas. What the hell? We gave it a shot, and we think we have a winner here. Banana baby food is available everywhere, and there are no artificial ingredients or colors. It’s just a consistent purée of real bananas with a jot of citric acid, and it works perfectly in a blender drink like ours. The proportions below were built around one six-ounce jar of bananas, and the recipe makes two generous portions of frozen goodness. 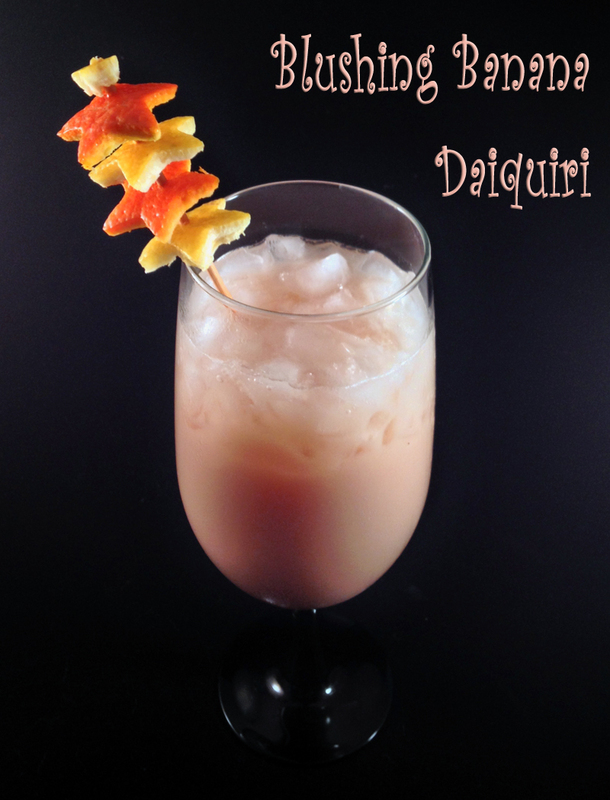 Remember Mom this Mother’s Day with our delicious, pale pink Daiquiri — after bringing you up, she needs a hefty cocktail! Blend on high for a good 20 seconds. Before pouring, you may add a jot of crushed ice to the glass to keep things frosty, and include a straw. Our garnish was an array of tiny stars cut from orange and lemon rinds using an antique aspic cutter. After all, isn’t your Mom the star of the show? 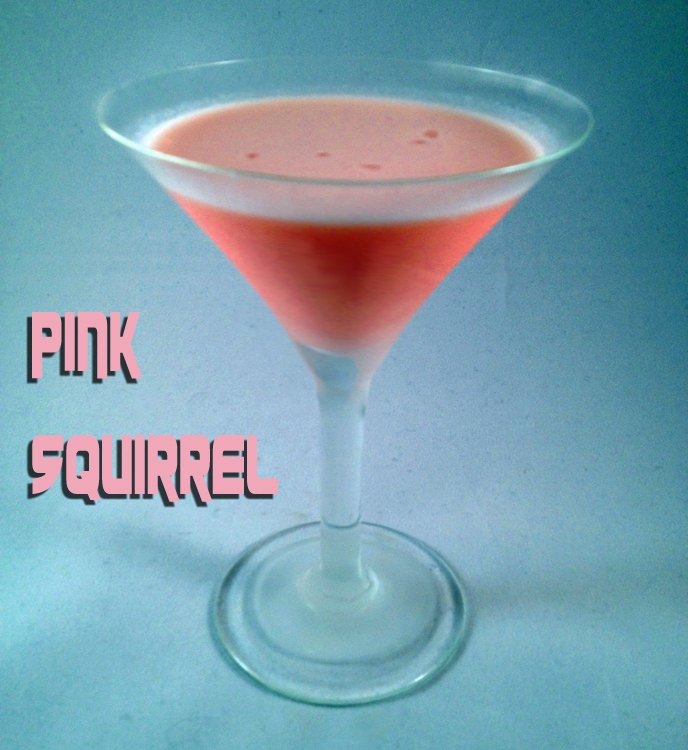 The story goes that the Pink Squirrel was invented in 1941 in a bar in Wisconsin, but didn’t enter the popular imagination until the Sixties when it became identified as one of the original “girl drinks.” Those suburban housewives were looking for something stronger than a lemonade in the afternoon while playing bridge or Mah Jong. The Pink Squirrel was thereby brought to ruin through the marketing of bottled versions in liquor stores, and powdered prefab make-it-yourself kits in supermarkets. The Cocktail Vultures love a challenge, and decided to rediscover what made this drink popular so many years ago. We kicked the recipe around the block a bit, took out the Creme de Cacao, and put back what we’ve discovered was an ingredient in the original recipe: ice cream. Shake long and hard with crushed ice; strain into a chilled cocktail glass. 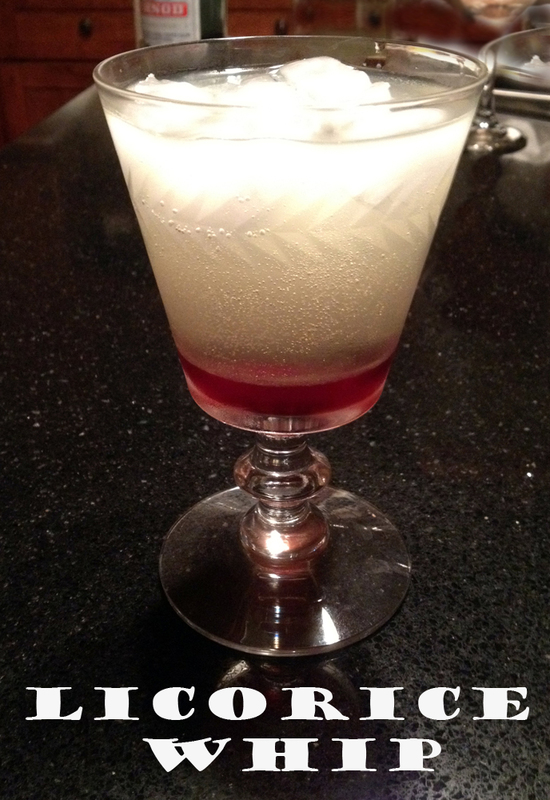 A note on Creme de Noyaux: it’s an almond-flavored, sweet liqueur. It’s old-timey and not easy to find. Brands include Hiram Walker, Bols and Marie Brizard. If you only manage to snag a bottle of Creme de Almond, add a drop of red food coloring to stay with the original pink color. 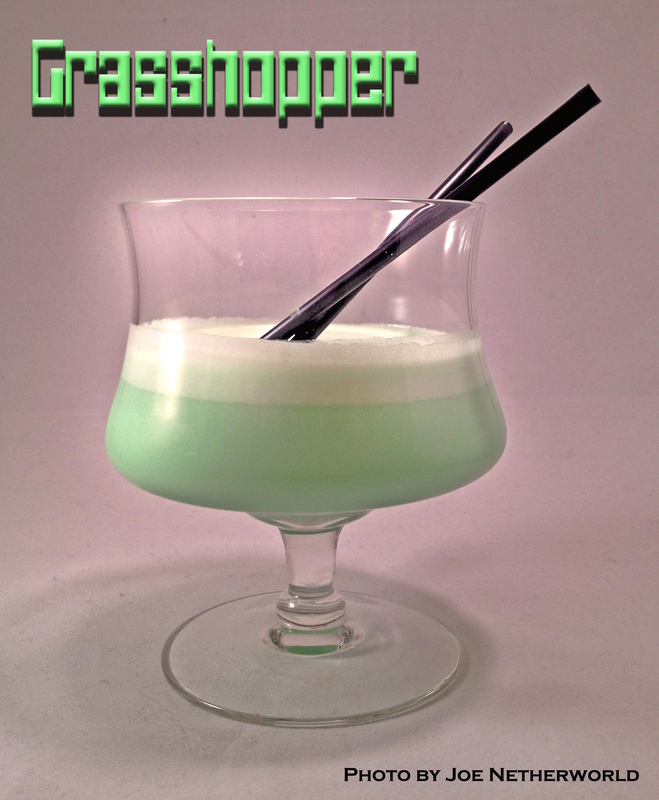 A sweet, creamy, minty cocktail that became popular alongside her pink sister, the Pink Squirrel, with the same crowd and for the same reasons. When tweaking the original recipe, the Cocktail Vultures turned once again to ice cream. And we threw out the Creme de Cacao and brought in a quality chocolate vodka. The chocolate flavor in most Creme de Cacao is phony and barely there anyway, and all it lends is a heavy stickiness. The ice cream provides sweetness, and the vodka gives a better jolt of chocolate as well as a pleasant kick that makes this more than a girl-drink.